It was on the island of Okinawa that the system of fighting that came to be known as karate was developed. 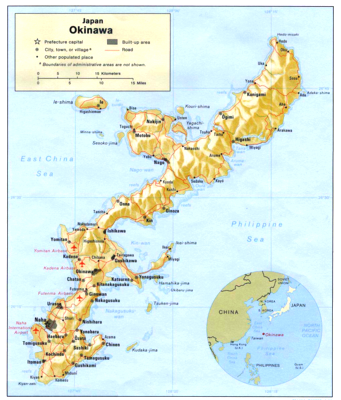 Okinawa is one of a chain of islands that are collectively known as the Ryukyu Islands that lie approximately half way between China and Japan. For many years karate was taught in secret and handed down from generation to generation as a way for the Okinawan people to defend themselves against the Samurai warriors from Japan. In 1477. Sho Shin (the king of Okinawa) imposed a ban on the private ownership and stockpiling of weapons by civilians. This attempt to control the people of Okinawa had a huge effect on the nature of the native fighting systems. The banning of weapons resulted in the Okinawan people having no other option but to use unarmed combat skills in the event of attack. At the turn of twentieth century a group of karate practitioners campaigned to have karate put on the Okinawan school system's curriculum. However, it was 'Anko' Yasutsume Itsou's (1830-1915) who successfully got karate added to the physical education program of the Shuri Jinjo Elementary School in 1901. As a result karate became widely practised by Okinawan children. Modern karate was originally taken to Japan in the 1920's by Master Gichin Funakoshi. He was invited by the emperor of Japan to run a series of demonstrations and then open classes in the universities, which led to karate gaining national recognition. Since this time, karate has become one of the world's most popular forms of self-defence and also provides fitness, self-discipline, confidence, control and many other benefits. There are many millions of people training in karate, and the United Kingdom has an extremely important role in the standards and regulation of karate around the world; a role that we are very proud to play our part in.